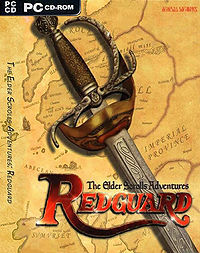 The Elder Scrolls Adventures: Redguard is a spin-off of the Elder Scrolls franchise set on the island of Stros M'Kai. Unlike the main series, Redguard is a third-person action-adventure game with no skills and a predefined player character. Its story takes place after the defeat of Prince A'tor, the leader of the Crowns, and the subsequent Imperial occupation of Hammerfell. You play as Cyrus, a Redguard mercenary who travels to Stros M'Kai in search of his sister, Iszara, who disappeared three months prior under mysterious circumstances. Redguard is available for download from GOG.com. Technical Tips and Hacks — Reference material concerning hacking, undocumented features, etc. Two further Elder Scrolls Adventures games, Eye of Argonia and Paradise Sugar, which were planned but never produced. This page was last modified on 17 January 2019, at 06:42.